Dr. Ateev Mehrotra, a professor and researcher at Harvard Medical School, had scheduled an appointment with his orthopedic surgeon one day for 8 am. Punctual by nature, he arrived on time, only to find that 35 other patients were all scheduled for that same 8 am time slot! You can imagine the mayhem that ensued. This inspired Dr. Mehrotra to develop a study that measured the value of the time wasted by patients pacing across the waiting room. What he found was that even though the average appointment lasted only about 20 minutes, patients spent an average of 64 minutes waiting to be seen by the doctor. That’s a lot of solitaire. In fact, in a 2014 Bloomberg study that ranked the most efficient countries for health care, the US ranked 44th out of 51 countries! But there is hope. A 2015 study by the Beryl Institute revealed that over 40% of health care practices make patient experience and satisfaction their top priority. With a little planning and due diligence, you too can optimize your practice’s scheduling policies to improve the patient experience. The three most common approaches to health care practice scheduling are the Steady Stream, Pure Wave, and Modified Wave methods. In this article we will define each approach, and discuss factors that will help you determine which is the best method for your practice. In this approach each patient is assigned a predetermined appointment time and length based on their particular needs. The obvious advantage of such an approach is that appointments are scheduled with the patient’s particular needs in mind, with the focus on giving each patient exactly what they need. In a perfect world, this is the simplest and most patient-centric form of scheduling. This method will work wonders for practices whose primary care is centered around routine procedures, such as optometric and dental hygiene facilities. It can also work for a diverse practice that has a number of highly specialized providers. The steady stream method will be the easiest and most straightforward way to schedule appointments that are even months in advance. But when a practice provides a wide variety of treatments to different types of patients, this method could make scheduling, and keeping to that schedule, a true nightmare. Consider a medical practice that treats patients who range in age from 20 to 65. Virtually every patient being seen on any given day will have a different type of appointment. What’s more, due to the variations in age, even a similar appointment like a routine checkup, could have different time requirements depending on the patient’s age. Scheduling with the steady stream approach would be like putting together a giant jigsaw puzzle, as the office manager attempts to fit all the different types appointments into a rigid timetable. This will result in costly empty time slots, and inevitable backlogs in the event that there are any delays. Unlike most surfing enthusiasts would assume, this method assigns a group of patient appointments to the top of each hour, or at particular intervals in the day. The assumption is that not everyone will arrive on time, and that patients do expect to wait a little anyway. The popularity of this method is driven by the fact that it ensures optimal productivity for each provider. There is always a patient waiting to be treated, and so no time is ever wasted. 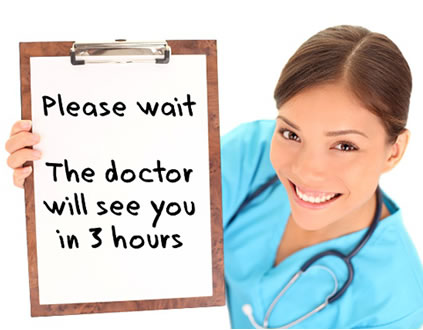 That is, except for the patient’s time. This is the method that led to Dr. Mehrotra to conduct his study, and the one that most likely influenced its results. But to what degree should you consider your patients’ experience at the expense of your staff’s productivity? A PwC survey of 6,000 people released this year found that 34% of people were willing to switch physicians if offered an ideal experience elsewhere. Yet another PWC study showed that personal experience had almost two times the impact on choices in healthcare than the next closest industry, hotels and hospitality. Evidence even suggests that there is a strong correlation between patient satisfaction and healthcare outcomes. It’s no wonder that practices aim to maximize the productivity of their valuable medical staff. But, though the short term benefits of this method are clear, the effect it will have on patient satisfaction, and eventually on the practice’s bottom line, have never been clearer. This method adopts the principal behind the Pure Wave approach, with a slight modification (hence the name) to make it more patient friendly. Scheduling using the Modified Wave involves double-booking the first appointment of each hour, then scheduling regular appointments after that, while leaving one empty slot at the end of each hour. On the off chance that both patients scheduled at 9 am will arrive on time, they will only have to wait for the one appointment that is ahead of them. Though there will be some waiting involved, it’s a far cry from the national average of 64 minutes! The empty slots at the end of each hour then give the provider the ability to make up for any delays that may have occurred in the last group of appointments. It allows the practice to account to appointments that may vary slightly in length, without causing too much backlog. Of course, if your practice has diverse procedure types that differ in length, these procedures will have to be grouped together in order to maintain a flow throughout the day. Do not fill up the empty time slot at the end of the hour with walk-in appointments. The reasoning for this should be clear, as it undermines the significance of that slot that should be used for catching up, not to create more backlog. Avoid double-booking new patients at the top of the hours, especially during peak hours. New patients simply take more time, and their first experience should be pleasant, never rushed. Take the time to do a thorough analysis of your appointment and provider types, and start experimenting with the scheduling method that seems most right for your practice. You may not get it right the first time, but simply focusing on improvement will get you closer to ideal scheduling than you ever thought possible. You’ve worked hard to build your practice, to attract patients, and to provide them with the highest quality care possible. So it goes without saying that the last reason you want to lose your patients is because they lose their patience. Sorry, I couldn’t resist the pun. Whatever your scheduling preferences, Patient Communicator makes everything easier with automated appointment confirmation and reminders, and a real online scheduler. The online scheduler enables your practice to set the available appointment schedule, while your patients can book their appointments online, in real time. Click here to learn more. About the author: Meir is the founder and CEO of Patient Communicator, a simple but feature rich platform that helps medical and dental practices of all kinds to better communicate with their patients. Meir is passionate about helping practices grow by enhancing the patient experience and improving practice efficiency. Learn more about Meir and Patient Communicator here.